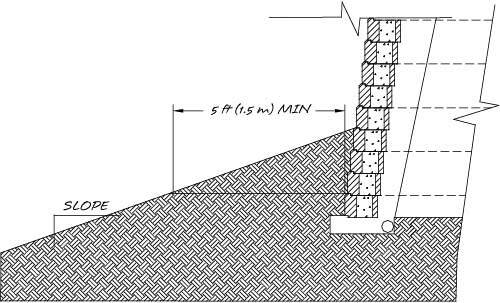 9.1 Wall embedment depth should be determined by the wall design engineer based on typical industry standard and specific site requirements. Walls with slopes below must have additional buried course for stability. For walls with slopes below, local ordinances commonly reference to bury enough blocks to have a 5 - 7 ft (1.5 - 2.1 m) level bench in front of the wall, and then the 1 in (2.5 cm) of depth per 1.0 ft (30 cm) of wall height rule is used beyond that point, Figure 9-1. After the wall is complete, the level area can be backfilled to continue the appearance of a continuous slope. In general when a slope below the wall is present, there is need for a global stability analysis to confirm the overall stability of the site. For those walls with slopes below or above. Walls built in sites with clays, silts, poorly graded sands, expansive clays and/or soils with a PI greater than 20 and or a LL greater than 40. The infill soil used must meet or exceed the designed friction angle and description noted on the design cross sections, and must be free of debris and consist of one of the following inorganic USCS soil types: GP, GW, SW, SP, GP-GM or SP-SM meeting the following gradation as determined in accordance with ASTM D422. For walls where more than 50% of the Internal Compound Stability (ICS) slip arcs fall at the back of the wall design envelope when ICS is run in AB Walls. We have identified a Design Envelope for the wall designer that defines the extents of an ICS evaluation within that envelope. An ICS analysis does not take into account a slope below the wall, as the bottom slip arc is located at the base of the bottom block. Therefore it will not provide guidance for what happens below the wall. 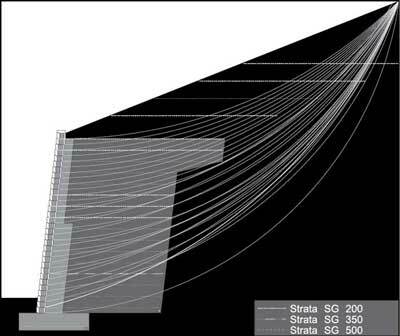 One easy to identify guide for additional global evaluation may be found by reviewing where the ICS slip arcs with the minimum factors of safety originate. When a concentration of ICS slip arcs originate at the back of the Design Envelope, a complete global stability analysis should be conducted, See Figure 9-2. Increasing the friction angle of the infill soil will increase the soil’s shear resistance which will increase stability. 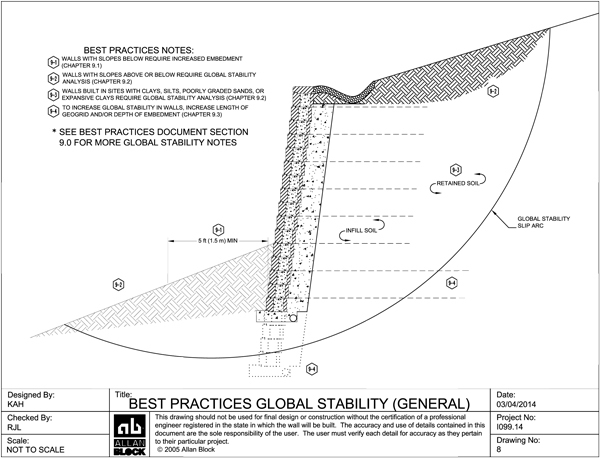 If the cause for the global stability problems is weak foundations soils, it may be necessary for the geotechnical engineer on the project to do foundation improvements before the retaining walls are built. 9.4 Whenever the groundwater is within 0.66H of the bottom of the wall, the global stability of the SRW system should be analyzed to assure that the adequate factor of safety exists for deep failures that pass behind the geosynthetic reinforcement and for compound failures that pass partially through the reinforced soil mass and partially behind the reinforced soil mass.